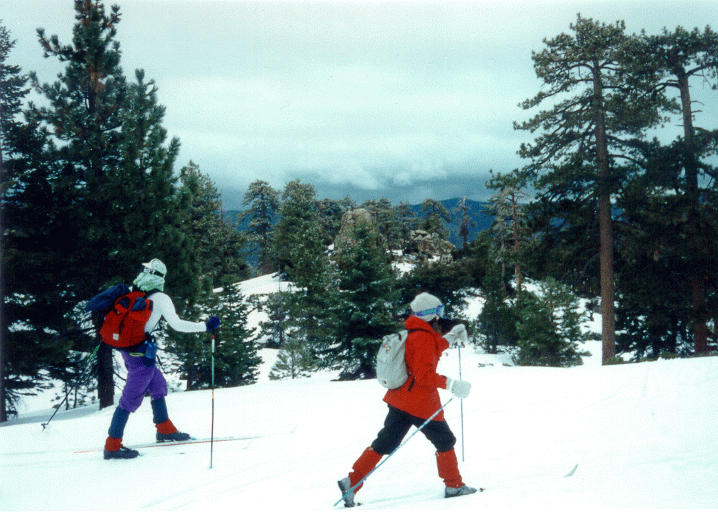 Ski Tours in Southern California has 68 of the best ski tours in the mountains of Southern California, from Mt. Pinos, San Gabriels, San Bernardinos (including Big Bear, and San Gorgonio), San Jacintos, and the San Diego backcountry. Each tour is illustrated with a map, and has a trip summary (with mileage and elevation information), directions to the trailhead, and trip description and directions. Index, maps, and photographs. Trade paperback, 211 pages, 5.38 x 8.25 x 0.41", 9 oz., Published 12/2000; reprinted 1/2002 (2nd printing) with updates, corrections, and improved maps. ISBN-10: 0-9614527-4-9. ISBN-13: 978-0-9614527-4-2. LCCN 2001-271352. Price: $17.95. Barnes and Noble: This book is available in some Southern California stores. Skiing can be dangerous! This book isn't a substitute for your own common sense. Don't use this book unless you are willing to take personal responsibility for your own safety. When skiing, be aware of hazards from inclement weather, ice, and hidden obstacles (such as holes, trees, streams, and rocks). Prepare yourself--bring proper gear, be fit, and obtain sufficient training and experience appropriate for the ski tour. Take part in a regular conditioning program and professional ski instruction--this will increase your enjoyment of skiing. Nothing in this book grants the right to trespass over private land.